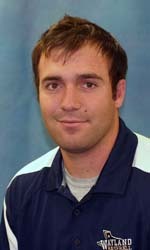 Brett Cook will join the 2010 Harrisonburg Turks coaching staff. Cook, currently a graduate assistant coach for NAIA Wayland Baptist University, has served as head coach of the junior varsity program. Brett Cook, Wayland Baptist University’s all-time hitting leader, finished his three-year Pioneer career with a career batting average of .426. The 2009 NAIA 1st team All-American at second base holds eight Pioneer batting records and is a two-time All-Sooner Athletic Conference honoree. Cook, the 2009 SAC Gold Glove winner at second base, holds the WBU career marks for runs scored (209), hits (269), and doubles (50), as well as the record for highest career batting average (.426) and slugging percentage (.731). A native of Kearny, Arizona, who transferred to Wayland from Lamar Community College, Cook established new season marks for his (107) and runs scored (88) in 2009. He is also the school single-game record holder for hits (5), doubles (3), and home runs (3). Cook will graduate in December 2010 with a degree in Exercise & Sports Science. He married his wife, the former Brandi French in June 2009. Welcome to Harrisonburg and the beautiful Shenandoah Valley, Coach Brett Cook.